New Evil. Same as the Old Evil, but with better PR. Mordak isn't bad as far as goblin kings go, but when someone or something starts pumping gold into the human kingdoms, it puts his rule into serious jeopardy. Suddenly he's locked in an arms race with a species whose arms he once considered merely part of a healthy breakfast. Maurice has just killed a dragon with a bread knife. And had his destiny foretold…and had his true love spirited away. That's precisely the sort of stuff that'd bring out the latent heroism in anyone. Unfortunately, Maurice is pretty sure he hasn't got any latent heroism. Meanwhile, a man wakes up in a jar in a different kind of pickle (figuratively speaking). He can't get out, of course, but neither can he remember his name, or what gravity is, or what those things on the ends of his legs are called…and every time he starts working it all out, someone makes him forget again. When the Supreme Being and his son decide that being supreme isn't for them anymore, it's inevitable that things get a bit of a shake-up. It soon becomes apparent that our new owners, the Venturi brothers, have a very different perspective on all sorts of things. Take good and evil, for example. For them, it's an outdated concept that never worked particularly well in the first place. A happy workforce is a productive workforce. At the moment, the Wizard's employees are neither. The goblins are upset with their working conditions, the dragonslayer has thrown a hissy fit over his medical insurance (or lack thereof) and everyone is upset about the terrible canteen coffee. Yet the Wizard hasn't got time to worry about revolution in the workplace - he's about to see his brilliant business plan (based on entrepreneurial flair and involving one or two parallel worlds) disrupted by a clueless young man. Side effects may include a huge hole in the fabric of reality. This is almost certainly going to be a bad day at the office. Would you listen to The Outsorcerer's Apprentice again? Why? I would and have done so. I listened it to it twice in a row. What other book might you compare The Outsorcerer's Apprentice to and why? 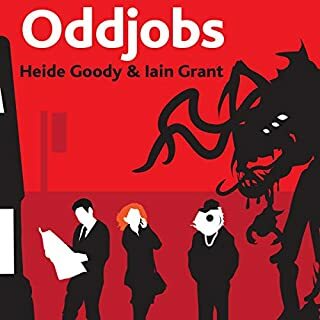 Kind of like Jasper Fforde but more cerebral and sharp; a lot like the Johannes Cabal series; Outside of this, hard to compare because it is rather unusual. Which character – as performed by Ray Sawyer – was your favorite? The King of the Goblins was funny, and I loved when Sawyer performed any cockney or lower-class British character--his accent is dead-on and incredibly timed. I laughed a lot and chuckled at some of the sly jokes. Throughout, it was funny and entertaining--you can easily miss some of the references if you aren't paying attention. This is an extremely clever and fresh book. The elements of the narrative are too outlandish to try to explain here, but somehow, the author makes them work together. The writing is sharp and funny and tongue-in-cheek. It is sort of a meta-fairytale in that it constantly plays on its own references to traditional fairytale tropes; in one moment, a character wonders if the fairytale land makes money from a "four percent leverage on traditional narrative tropes." You may find the narration a little slow at first, but Sawyer knows exactly what he is doing. As the story unfolds, he voices additional characters perfectly and sets the pace well. One thing about this book: it requires your attention. There are so many little things going on, and if you are not listening attentively, you may miss them. I found myself rewinding it again and again just to catch small stuff. However, it is totally worth it because the dialogue and narration are so funny and, at times, quite smart and thought-provoking. This is the only book I've listened to twice in a row, in addition to the thousand rewinds in between. I recommend it if you like stories that collapse genres, make you think, and are a bit silly and unconventional. By the way, I think Tom Holt did some brilliant writing and storytelling here. I hope he writes more like this. It reminded me of Jasper Fforde with a bit more gravitas and slyness and subtlety. I teach literature and plan on teaching this in an Ethics and Values in Lit course. It brings up many philosophical and ethical issues that would get college students thinking. If you are a person who would prefer not to think of such things, you will still like the book--they are woven into the narrative so strategically that you can overlook them and just enjoy the silly goings on. Either way, I highly recommend. Not quite Tom's usual standard but amusing and a few nods to respected authors. 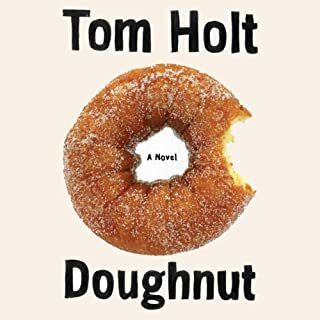 I fear mr Holt has run the doughnut series too far, yes Art and his uncle are an entertaining pair, but they can't save every story. Perhaps a link to a previous story might be needed. Paint your Dragon always makes me snort liquids. This book was suggested because of my love of Christopher Moore's books. I thought I had found a new writer to get into that was into the quirky but this just wasn't it. It had all the bones to be great but it just didn't get there. Not sure if it was because the story was just too slow or because of the performance but it just didn't do it for me. If you've taken a look at books like "Off to be the wizard", prepare for disappointment. The story is okay but it's plodding and not too much happens. Characters appear to be rather 2 dimensional. This ISN'T a comedic how to guide for how to manage a kingdom. Nor is it an Office Space style parody story filled with incompetent managers in a medieval/sorcery setting. Interesting story, but I got lost about half way. The book was enjoyable. It was likened to a Jasper Fforde style story. I only lost my was a little bit. I'm not saying I wouldn't listen to it again, but I may not. The ending was good, can't say that it helped the story, but I liked it. I'd say Red was my favorite. Ray does a good job with her voice. Not that his voice sounds like a girls voice at all, but that the tone matches what I expected. I think she stole the book. I'd rent the movie on DVD or just wait till it comes on cable. Not a book I'd turn into a movie. Although not noted as such, this is really part of the series that began with Doughnut. 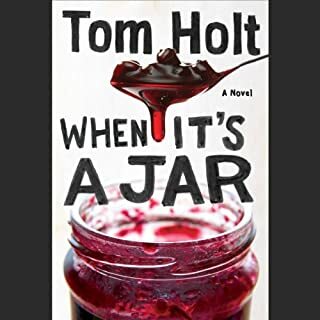 However, reading Doughnut and When It's a Jar is not really necessary to the plot of this story (which is somewhat of a spin-off rather than a sequel). In many ways I enjoyed this book more than the previous 2 books. It wasn't as bogged down by the scientific theories and explanations that necessarily governed Doughnut. If you are already a fan, you will not be disappointed. If not, I would recommend starting with Doughnut. Refreshing new take on the traditional "fairy tale" setting. The characters were a bit one-dimentional but the story was fresh and interesting. 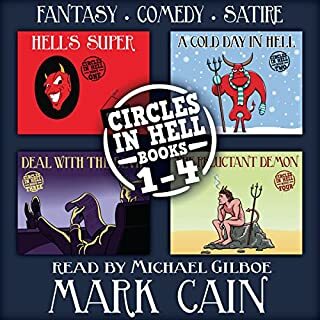 Peppered with great bits of wry and sarcastic humor that I really enjoyed. Absolutely super narration. I can't say enough for the delivery done by the voice actor. I had really high hopes for this - I always do with Tom Holt's books. I am always hopeful that his next book will be as good as his Portable Door/Wells & Co trilogy; unfortunately nothing so far has topped it and this is no exception. It's not terrible - it was funny in places and had a reasonable plot, but I was expecting more depth and development with regards to the characters (especially Buttercup and Florizel) and the place, but that never happened. Overall, it felt like an overspill from another story and I was never sure whose story it was. I'm wavering between a 2 and 3 star rating for the story. The narrator, Ray Sawyer, is always perfect. If you could sum up The Outsorcerer's Apprentice in three words, what would they be? The narration by Ray Sawyer is excellent, the story is very unusual, but humorous, clever, and just magical. Chapter 11 - Meeting the giant with two heads. "Patronise me, you b****rd?" I hadn't read any of Tom Holts humorous novels before, only the historical books. I've been utterly enchanted by this book, in fact I stayed up all night to listen. 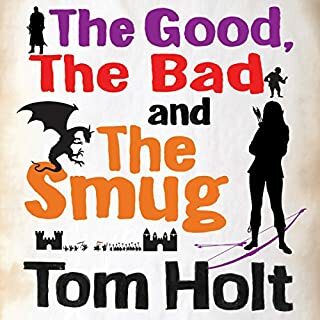 I have now purchased several other Holt titles to enjoy.Tom Holt writes with a such a clever, razor sharp wit, & the plot was intelligently thought through. I personally find his writing comparable to that of the late great Douglas Adams whose works I also admire hugely. Warm humour and the usual mix of likeable characters and an easy plot. Tom Holt is always a good read if you're in the mood for something that asks only one thing of you: enjoy. 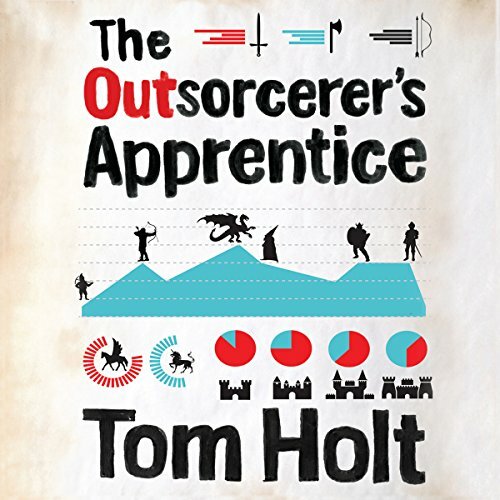 Where does The Outsorcerer's Apprentice rank among all the audiobooks you’ve listened to so far? It's an ok story but not the best I've listen to or read by Tom Holt. I do like Tom Holt but he can be hit and miss. Did a good job made the story easy to listen to. No, just killed some time. Really enjoyed this. Excellent narration and plenty of things to smile and laugh at, wonderful language and concepts (especially for the scientifically gadget-conscious). 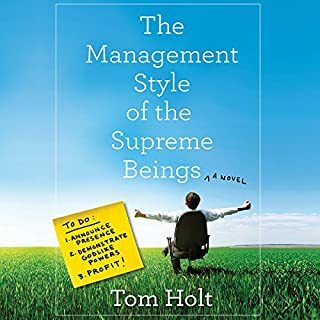 I normally love Tom Holt's books but this one just didn't do anything for me. I tried quite a lot to like this one too and gave it quite a good chance but it kept putting me to sleep! I ended up just putting it on at night as a sleep aid....not exactly what I would be looking for in an audible book. Such a shame. Excellent book/narration. Pity about the editing! I enjoyed the story very much, and the narrator is good at creating different characters and really bringing the story to life. However, as with many other Audible audiobooks, it's obvious that it hasn't been carefully edited. There are several places where the narrator pauses, then re-reads the previous sentence to correct an error. This tends to snap the listener right out of the story, which is a pity. soaring imagination and beautifully drawn characters. this is a yarn for a long drive which you won't even notice. be prepared to spend extra time in the car if it is not finished by the time you arrive.